I stumbled on an old photo of my great-grandparents Michael John Walsh Jr. and Mary McGinty taken in Murdock in 1924 or 1925. 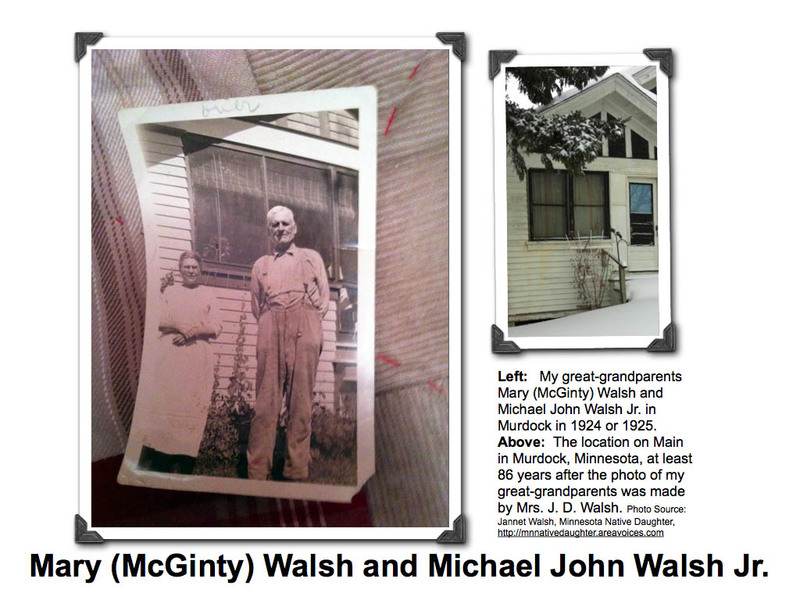 The photo above, my great-grandparents Mary (McGinty) Walsh and Michael John Walsh Jr. in Murdock in 1924 or 1925. Above: The location on Main in Murdock, Minnesota, at least 86 years after the photo of my great-grandparents was made by Mrs. J. D. Walsh. Michael John Walsh Jr. was born Oct. 15, 1858, in Canada, and died March 11, 1929 in Swift Co., Minn. Mary McGinty is the daughter of Patrick and Mary (Moran) McGinty. They were married Nov. 22, 1881, at St. Bridgetâ€™s Catholic Church, De Graff, Minnesota. I am still in the process of I preparing a video on my Great-Great-Grandparents Patrick â€œPaddyâ€ McGinty and Mary (Moran) McGinty. Patrick McGinty and Mary (Moran) McGinty had daughter named Mary McGinty, born June 23, 1859 in Scotland, and died Oct.1, 1952, Swift County, Minnesota. Patrick or Paddy was born Jan. 1, 1829, in Mayo, Ireland and died Dec. 26, 1915, Swift County. I donâ€™t have a photograph of Patrick and Mary (Moran) McGinty, but I will show you in an upcoming blog post about the treasure they left behind! Do these names mean anything to you? Do you have photos? Do you think you could be related to me? Tell me at jwalsh@wctrib.com. Click here to follow my genealogy posts on Minnesota Native Daughter. This entry was posted in Blogging, Family, Genealogy, Minnesota Native Daughter, Murdock news, Patrick McGinty and Mary (Moran) McGinty and tagged family, Genealogy, Jannet Walsh, Minnesota Native Daughter, Murdock, religion, Rural, Travel on January 31, 2011 by Jannet Walsh. I plan to post a video shortly on my Great-Great-Grandparents Patrick “Paddy” McGinty and Mary (Moran) McGinty. Patrick McGinty and Mary (Moran) McGinty had a daughter named Mary McGinty, born June 23, 1859 in Scotland, and died Oct.1, 1952, Swift County, Minnesota. 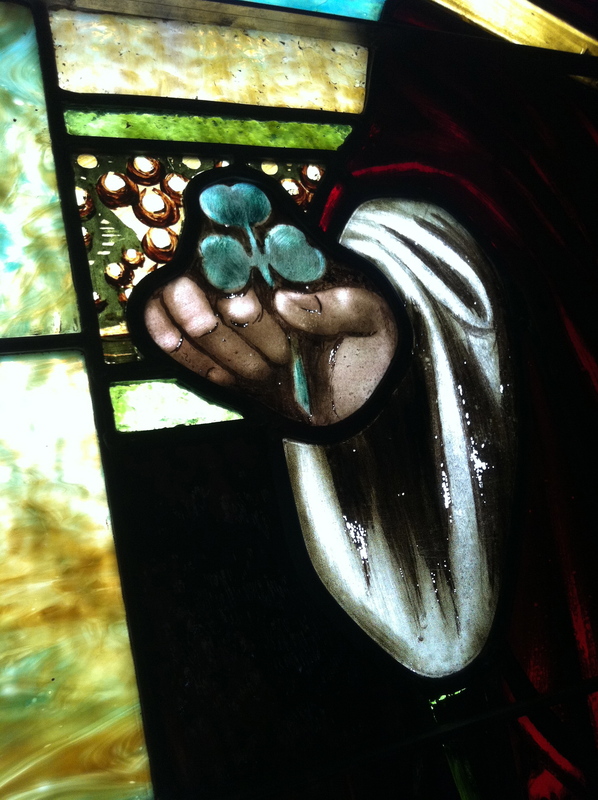 Patrick or Paddy was born Jan. 1, 1829, in Mayo, Ireland and died Dec. 26, 1915, Swift County. 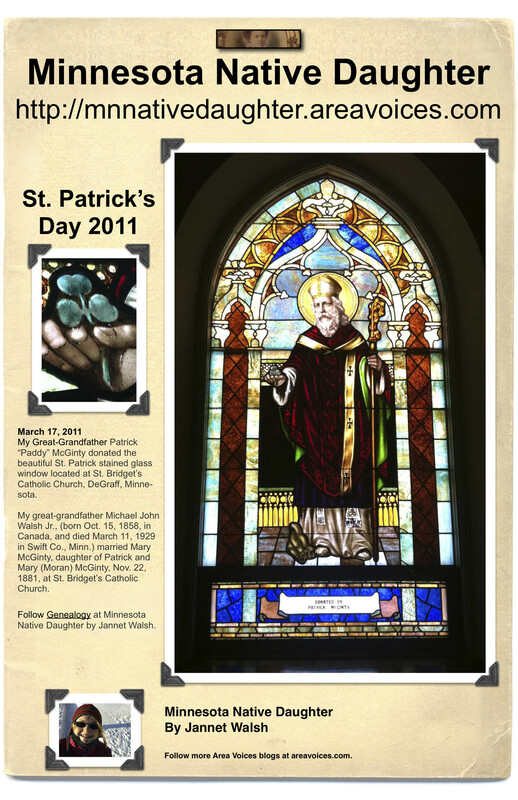 My great-grandfather Michael John Walsh Jr., (born Oct. 15, 1858, in Canada, and died March 11, 1929 in Swift Co., Minn.) married Mary McGinty, daughter of Patrick and Mary (Moran) McGinty, Nov. 22, 1881, at St. Bridget’s Catholic Church, DeGraff, Minnesota. I don’t have a photograph of Patrick and Mary (Moran) McGinty, but I will show you in an upcoming blog post about the treasure they left behind! This entry was posted in Blogging, Family, Genealogy, Minnesota, Minnesota Native Daughter, Patrick McGinty and Mary (Moran) McGinty, Religion and tagged blogging, De Graff, family, Genealogy, Jannet Walsh, Minnesota Native Daughter, Patrick McGinty and Mary (Moran) McGinty, religion, Rural on January 28, 2011 by Jannet Walsh.